We are a couple of self-styled espresso aficionados in our late 60’s, based in Victoria, Canada. Paul Gully is a (mostly retired) public health p hysician, who continues an interest and involvement in global health issues. Lois Leslie, a human rights lawyer, is retired from paid employment but enthusiastically engages in pro-bono international human rights research and writing. When not working or adventure-seeking, we love to spend time with our grandchildren in Victoria and Paris, France. We became hooked on cycle-touring when cycling across Canada, in 2013. 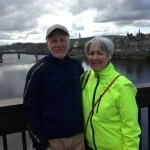 Since then, we have cycled from Vancouver to Monterey, California and from Lands End, England to John O’Groats, Scotland. Between March 2017 and September 2018, we travelled by bicycle, foot and public transportation In Europe, Asia and Australasia, (Lisbon to Auckland), using the trip to draw attention to and raise funds for Parkinson’s Disease, Shifting Gears for Parkinson’s.